Having lived all our lives everywhere but under a rock, we were fully aware of the upcoming state elections in India. And, having experienced what it means to be in midst of one, in Assam and Madhya Pradesh, we were quite determined to avoid a repeat. After careful scrutiny of the prevailing political situation, we decided on Bengal for our 2016 Thanksgiving trip where we could laze around and be amused by the rest of the country fretting over a piece of meat. Then came November, the eighth. We spent the final week before our trip queuing in lines for a wad of 2000 rupee notes, the most useless piece of legal tender currently available on the planet. After a good deal of cajoling and imploring a bank manager, I managed to convert one of the note into a sack full of ten rupee coins. Cutting the long introduction short, we finally landed in Kolkata on a foggy Saturday morning with enough money to either buy a Bvlgari Leather Bag or a Kullad Chai and nothing in between. As the flight from Pune leaves at an ungodly morning hour, we had enough time for a full day out in the city. We started the festivities with its most iconic monument, the second most famous marble building in the nation, the Victoria Memorial. The fact that it is all marble, which surprisingly is not known to many, was a deliberate intent to make a building which would be to the Raj what Taj is to the Mughal era. After a brief stop at the underwhelming St. Paul’s Cathedral, we went to the Indian Museum, one of the many decaying colonial buildings across the country. The museum sculpture collection spanning the entire gamut of Indian History does make the dekko worthwhile. We rounded off the day with a visit to the Marble Palace, a 19th century mansion housing impressive European art, Tagore’s House and a trio of 19th century Jain Temples, which would have been more at home in Gaudi’s Barcelona than Ranakpur or Mount Abu. If you are wondering how we could manage all this in our quixotic budget, all the entrances were free or under ten, the lunch was at card accepting Domino’s and we had booked a taxi for the entire day, carefully running up the bill as close to 2000 as possible. The only challenge was to make the taxi driver accept a hefty tip so that we can palm off a 2000 rupee note. The night was spent hunting for a travel agent who would supply us with a car and a diver for our Bengal road trip in exchange for digital money. Couple of hours north of Kolkata is Hooghly, famous for its mid-19th century Imambara which in turn is famous for its massive mechanical clock. The clock is still in working condition wound weekly using a gigantic 20 kg key. After a laborious up and quick down the tower housing the clock, we headed to Bansberia, home to the oddest pair of buildings on the planet. 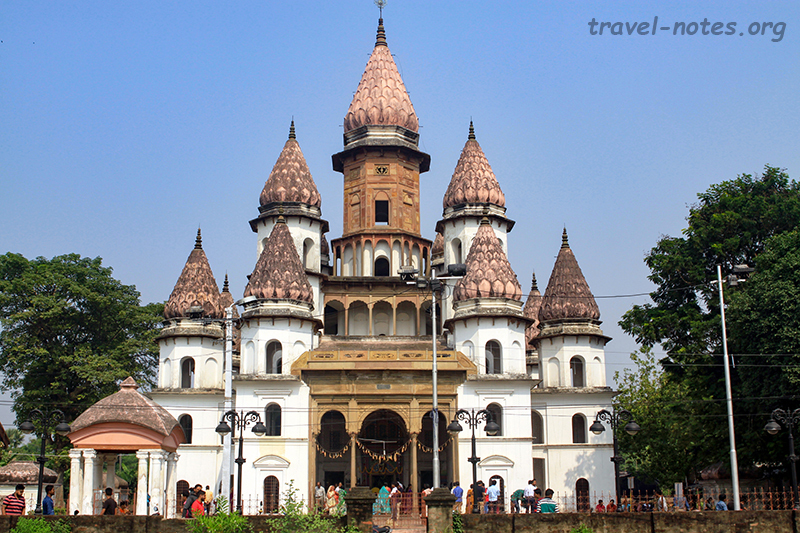 One of them, Hangseshwari Temple, looks like a cross between a Moscow Cathedral and a Disney Castle and the nearby Ananta Basudeb Temple is the archetypical example of Bengal Ek-Ratna Terracotta architecture. We spent the afternoon driving to Bishnupur keeping a lookout for remote villages with a working ATM. Unlike popular beliefs, these remote ATMs are actually flush with cash, that too in the useful 100 rupee denomination, the primary reason being that the villager’s bank balance hardly ever crosses three figures. We raided one such ATM, quickly hid our booty of precious hundreds and walked out publicly counting our pre-existing stash of 2000 in order to avoid undue attention. 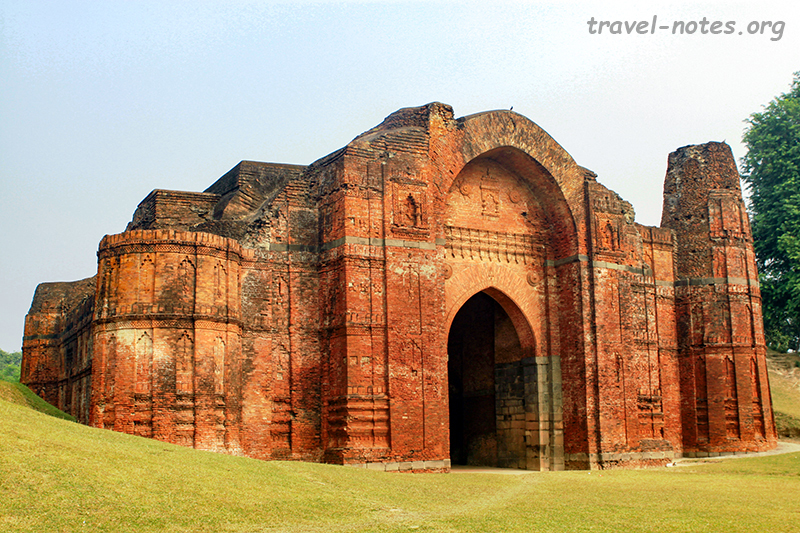 Bishnupur was the capital of the Malla dynasty which had an unbroken run from the 6th century up to the British era, thanks mainly to the remoteness of the place and the willingness of the Malla Rajas to remain vassals under the various Islamic overlords. The result is that the entire town is exploding with terracotta temples, the architecture style of the Mallas, completely untouched by the vandalism of the conquerors. You can easily spend a couple of days exploring the region, but the highlights – Jor Bangala, Shyam Rai, Madan Mohan, Radhe Shyam and Rasmancha can be covered in half a day. A three hour drive brought us to Shantiniketan where Gurudev started his famous open-air school which has now grown into a premier university in India. The Institute of Fine Arts is teeming with famous award winning art pieces and murals by the likes of Nandlal Bose and Ramkinkar Baij. It was quite amazing to see these murals adorn the walls of the likes of boy’s hostel and still be in pristine conditions. Three more hours of driving, this time on potholes instead of roads, brought us to Baharampur, our stay for the night. 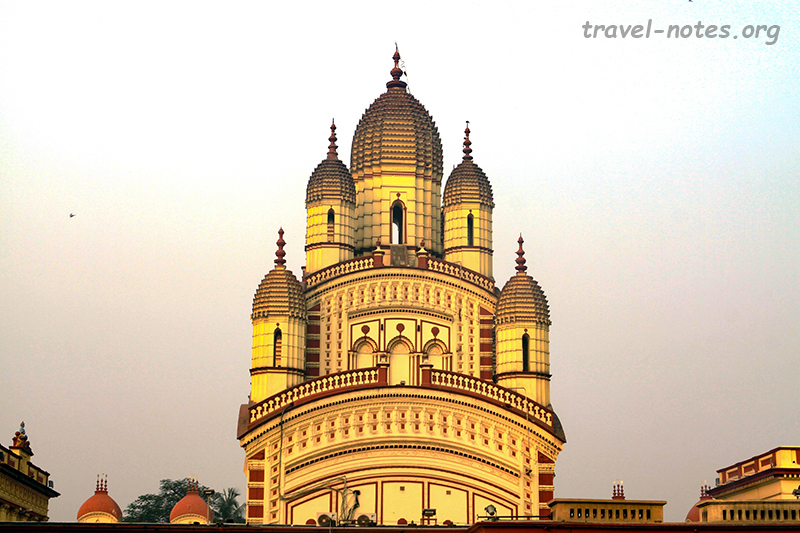 The only reason a tourist comes to Baharampur is because that is where the nearest hotels are to Murshidabad. 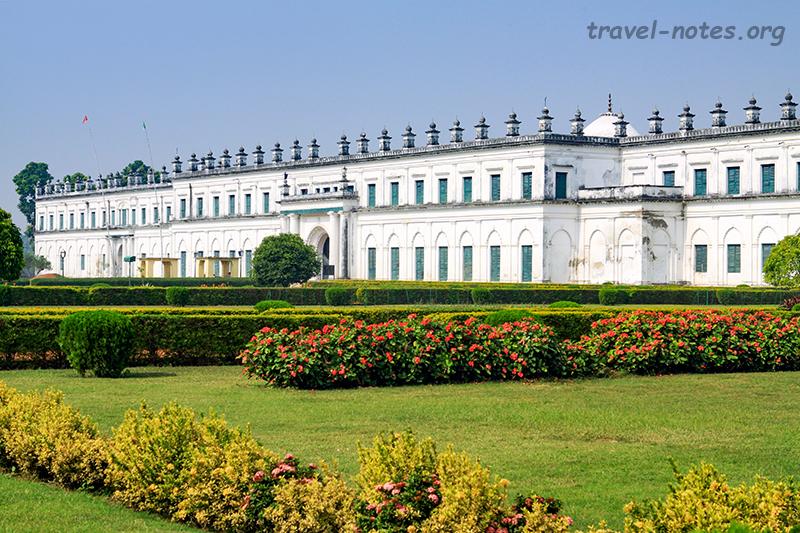 The only reason why a tourist goes to Murshidabad is because that is where the Nawabs of Bengal lorded over this region from. But before we could check out the sites, we had to deal with the repercussions of Modinomics. A guide had to be enlisted and his opening bid of Rs. 1,500 had to be upped to Rs. 2,000 after what can only be described as heavy “barlosing” – as, in the antonym of bargaining. There you go – I have just made the greatest contribution to the English vocabulary after Sarah Palin’s “refudiate”. Where were we? Ah yes, Murshidabad. Murshid Quli Khan, Subedar of Aurangazeb, founded the city in 1702 and soon after the emperor’s death, declared himself to be the first Nawab of Bengal. We started off the proceedings at the Katra Mosque built by the Nawab which also was his final resting place. Then we moved onto the palatial Kathgola Palace built by a rich Jain merchant, the tomb of Azimunnisa, the daughter of the first Nawab, Namak Haram Gate, the place where the last independent Nawab Siraj-ud-Daula was treacherously murdered, a long laundry list of minor sights and finally reached the majestic Hazarduari Complex. This astonishing complex contains Nizamat Imambara, the largest in the nation, an impressive Clock Tower, a well-proportioned Madina Mosque and the Hazarduari Palace. Built in the early nineteenth century under Nawab Humayun Jah, this elegant palace houses one of the best museums in the country. The afternoon was spent driving to Malda where we rested for the night. It was within 25 kilometers of Malda where all of the pre-Mughal history of the Bengal played out. The nearby Gour (erstwhile Gauda) was the site of the first Bengal kingdoms – the Buddhist Pala (6th -11th c AD) and the Hindu Sena (11th – 13th c. AD). Apart from a foundation of a ruined palace complex, nothing remains from this period mostly because all the buildings from the period were torn down and re-used to build mosques during the Bengal Sultanate era. It is for the mosques that Gour is famous for today. These well-proportioned buildings built of deep red sand stone with a maze of arches and stunning domes, some of which port original tile work, present an architectural style found nowhere else on the planet. The most notable monuments include Baro Shona Masjid, Dakhil Darwaza, Firoz Minar, Qadum Rasul Masjid, Chamkan Masjid, Tantipara Masjid and Lottan Masjid. The place is generally ignored by the tourists as most of the monuments are so obscure not to even have a Wikipedia entry. Stumbling on these monuments as you drive through blind alleys makes it a magical experience. If that doesn’t sound Indiana Jonesy enough, sooner or later, as you ramble around the ruins, you will stumble upon the fourth longest international border, the one between India and Bangladesh. It was just a month ago that we were standing inside a posh Kashmiri Walnut room inside a posher Viceroy Palace in Shimla where 70 years ago, people were drawing lines on a map. Today, we were looking at its consequence – several miles long line of lorries wasting time and energy trying to cross the said Radcliffe Line. On the other side of Malda is Pandua, where the capital was shifted in the mid-14th century so that the future tourists of the 21st century can conveniently lunch at Malda while checking out the entire region. Utilising the said convenience to the fullest, we headed to the prime attraction of Pandua, the ruins of largest mosque in the sub-continent, Adina Mosque. Built in 1373 by the second sultan of Illyas Shahi dynasty, Sikandar Shah, the mosque once had 260 pillars and 387 domes. Few that have survived the ravages of time gave us a window to its glorious past. After getting lost for an hour in the sprawling complex, we rounded off the day by visiting the nearby Ek Lakhi Mausoleum, so named as that was how much it cost to build it and the Sona Masjid, so named as it ported golden domes in its heydays. 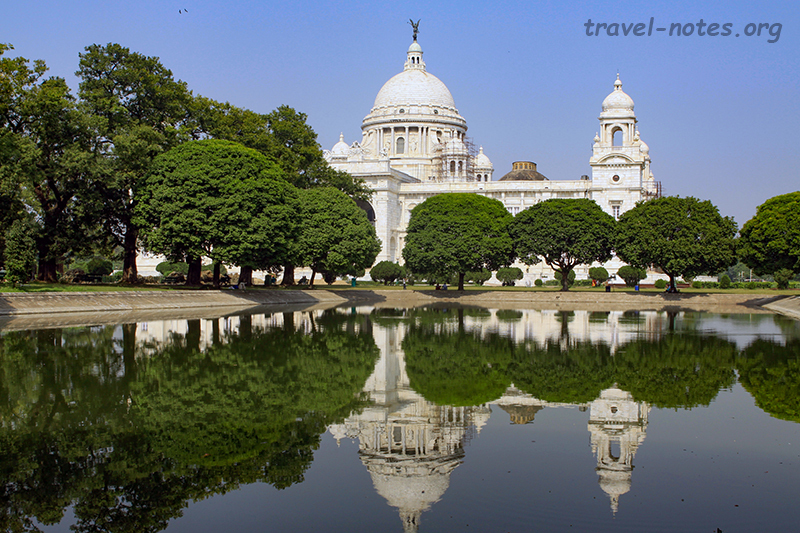 An overnight train dropped us at Sealdah the following morning and thanks to Modinomics, we did not have enough money on us to get to the hotel, but had enough to hire a taxi for an all-day sightseeing of Kolkata. We headed straight to the three places in Kolkata that are open before mid-morning: the 19th century Dakshineshwar Temple famous for its fairy tale castle appearance, the wonderfully serene Ramakrishna Mutt, home to the famous Indian mystics Ramakrishna and Vivekananda and the sprawling Botanical Gardens, home to the Great Banyan Tree, the largest in Asia. We then headed back to the city centre to check out the Netaji Bhawan, the house from which Subash Chandra Bose made his last daring escape, and then spent an hour searching for the Park Street Cemetery. As Bengal was the first English settlement in India, it is here that the oldest cemetery is located. With most tombs dating from late 18th century and their architectural styles spanning everything from Gothic to Odishan, the cemetery was worth the effort it took us to find it. No trip to South Bengal is complete without Sundarbans, where the mighty Ganga and Brahmaputra have ganged up together to form the largest delta on the planet. To get here is an adventure. It takes three hours to drive down the distance, thanks to the road insisting on going through every kitchen in every settlement along the way. Then you ride a Huckleberry Finn ferry along with a hundred other souls to the largest island, Godkhali. Then you have to traverse it, part on foot and part on a rickety contraption that looks like a cross between a motor cycle and a donkey cart. And you still have one more ferry to get to one of the final inhabited islands. It takes a better part of the day to get here and the rest to recover from the shock. By some inexplicable miracle, I did. But unfortunately, Aparna didn’t. Since we had enough medicine to put a hypochondriac to shame, Aparna managed to get herself in some sort of shape for the following day’s adventure – a day long safari though the Sundarban National Park. The safari in Sundarbans is unique in many ways. First of all, it is all day and secondly, it is on a boat and not on a rocking jeep or a recalcitrant pachyderm and thirdly, the boat has a kitchen downstairs and a flush toilet at the rear. Floating past dense mangroves through narrow channels, past sunbathing crocodiles and lumbering monitor lizards, counting parakeets, kingfishers and great egrets, all while sipping hot chai must go down as one of the greatest experiences this planet has to offer. The only downside of all this is that when all this comes to an end, you are staring at the return journey to Kolkata and not to mention the flights thereafter. Click here for more photos from Kolkata. Click here for more photos from Hooghly, Bansberia, Shantiniketan and Malda. 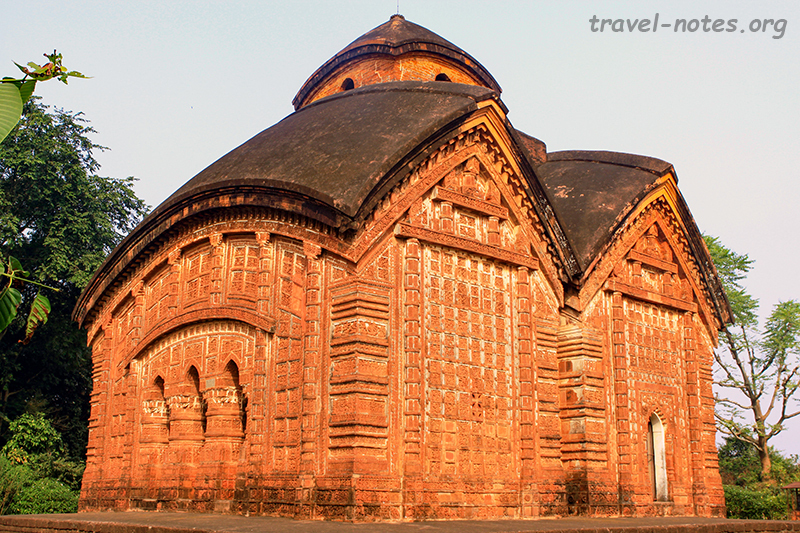 Click here for more photos from Bishnupur. Click here for more photos from Murshidabad. Click here for more photos from Gour. Click here for more photos from Pandua. 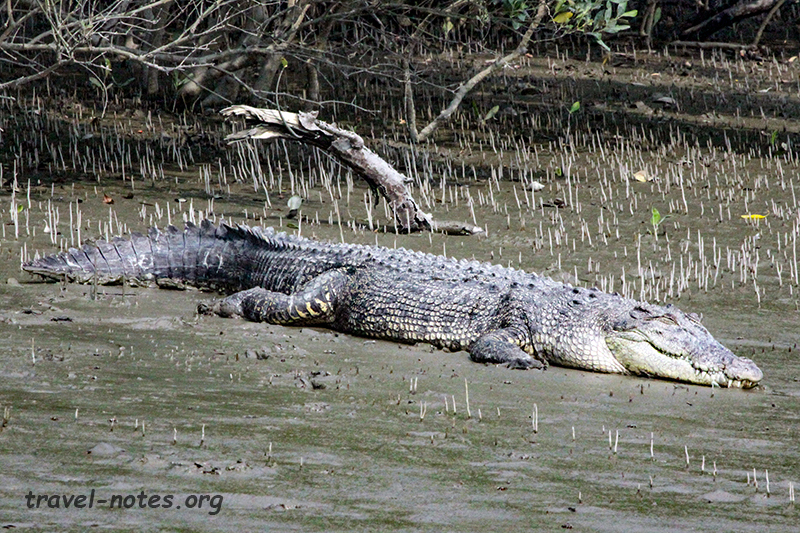 Click here for more photos from Sundarbans.